Nestled between dollops of blood and hilly piles of expended ammunition is RoboCop’s scathing blitzkrieg of societal satire. 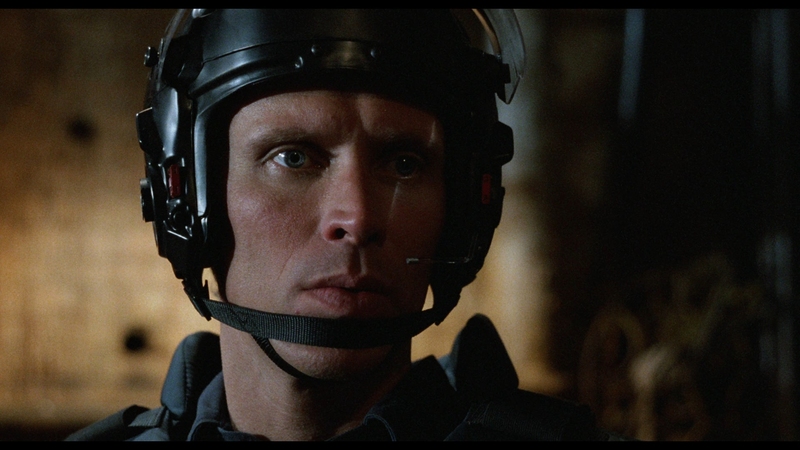 Built on a title meant to be tucked away for crude direct-to-video slop, Paul Verhoeven’s fearless jabs at capitalism, marketing, corporate in-squabbles, and imbecilic television elevate a revenge narrative of half man, half cop into stardom. This is a story of a murdered cop, brutalized to comic extremes by Clarence J. Boddicker, a villain name with no room for niceties. Alex Murphy is stripped of human rights (he signed a contract) and sealed in a cozy, full body soup can to roam the streets of New Detroit and grumble digitized one liners. 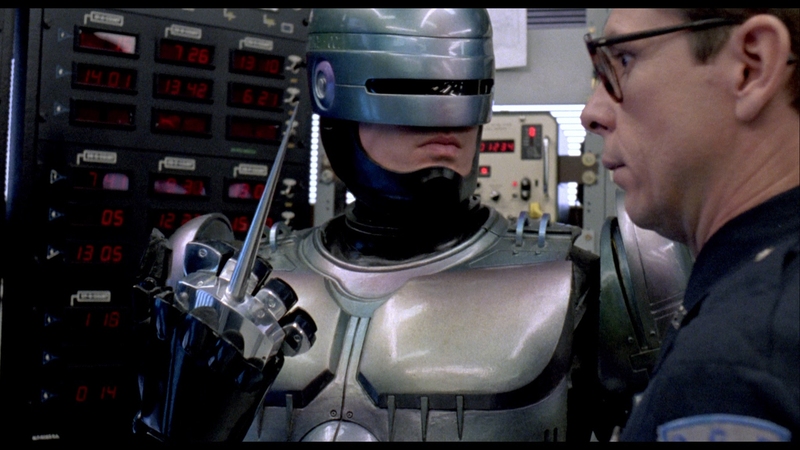 That should be the end for RoboCop: The computerized zombie peers from his digitally graded eye shield and pops Boddicker with military grade hardware. Instead, the film finds itself in Oscar contention – three times over – as impeccable scripting marches through absurdity in search of more situational escalation. 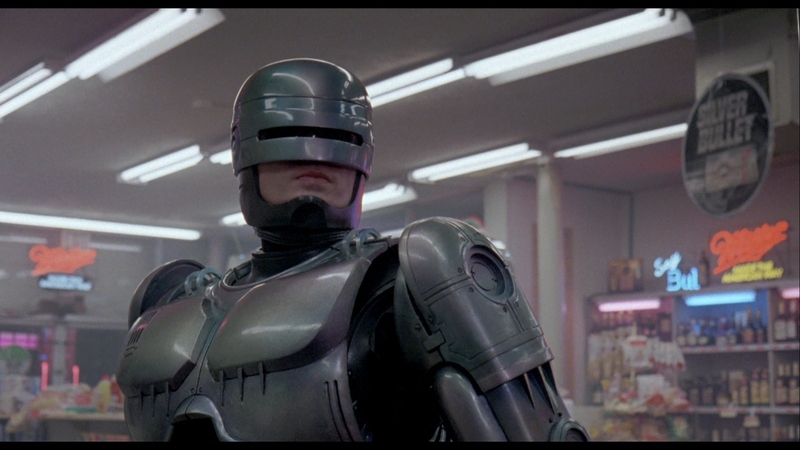 If RoboCop is anything, it’s not boring. Between the scenic explosions and one-off shoot outs, there is an underlying snippet of humanity caught up in a rush for profits. Verhoven’s near masterpiece is a colorful sci-fi charade, marketing itself as brainless escapism before injecting swatches of vivid commentary, with no room for misrepresentation. 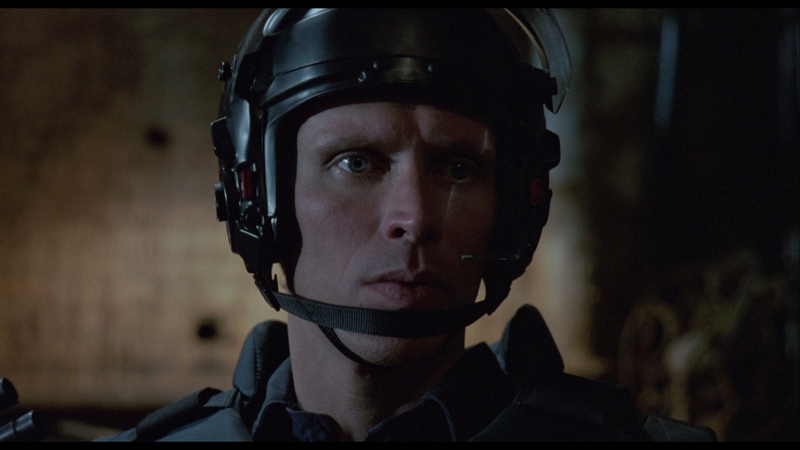 Peter Weller slips into the suit, as faultless and timeless as a design can be, without worrying about the film being carried on his own. 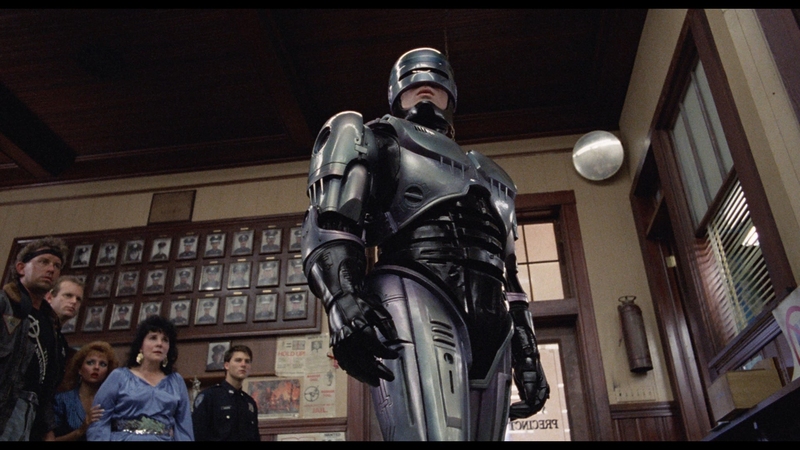 While unblemished in selling the conceptual robotics, RoboCop is flamboyantly overdosed on casting. 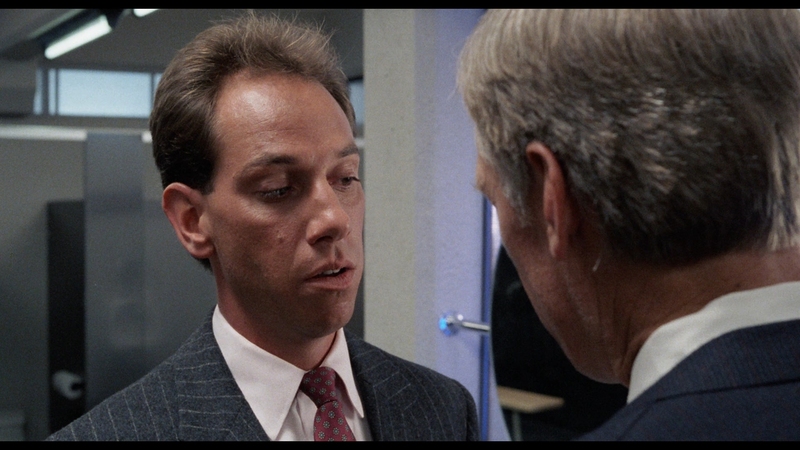 From its loud mouth criminals to gerrymandering boardroom suits – even the sleaze broadcast across in-movie televisions – RoboCop’s character support systems are ingeniously utilized. 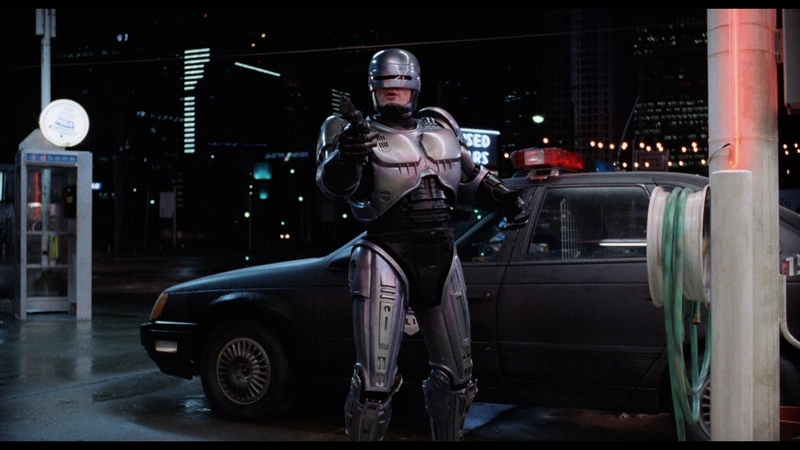 As a product of the late ’80s and despite the quaint depiction of a world still running on the haze of CRT TVs, RoboCop has never diminished in relevancy. 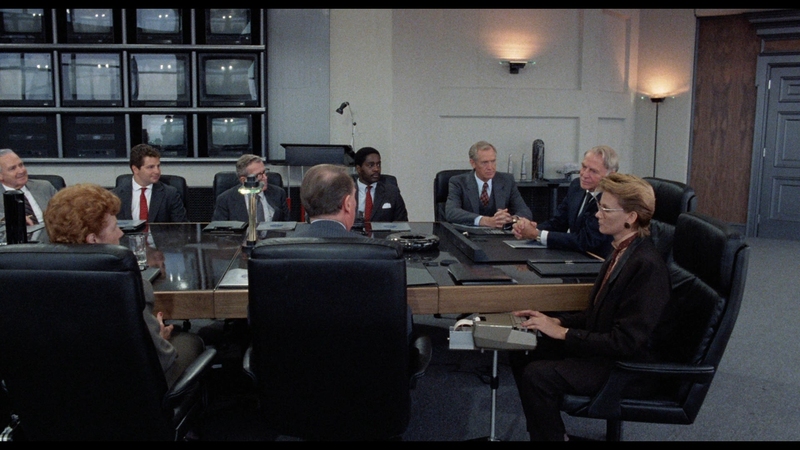 Staying power is a rarefied cinematic quality, yet we still need RoboCop to break into board meetings. If the government won’t string up Wall Street fraudsters, we have someone who will. Assign him the directive. 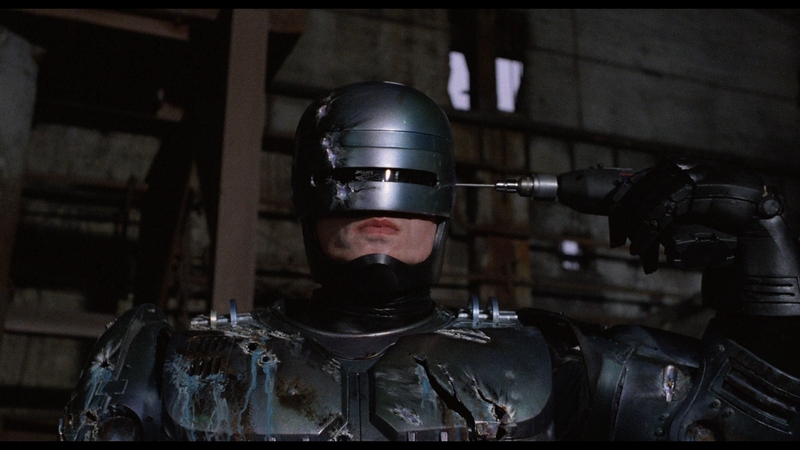 In the end, maybe RoboCop failed. Draped onto comic books, video games, animated cartoons, and film sequels, somewhere the franchise expelled the negative ideals of commercialism it portrays. 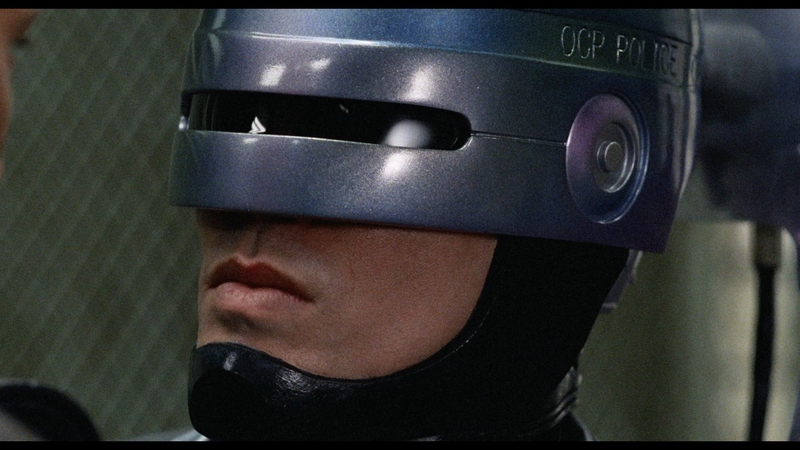 RoboCop lives in its own irony. Omni Consumer Products, the fictionalized corporation which birthed this near invincible mass of metal, actually wins. We’re still buying Robo-merch. Then again, that’s probably the joke. 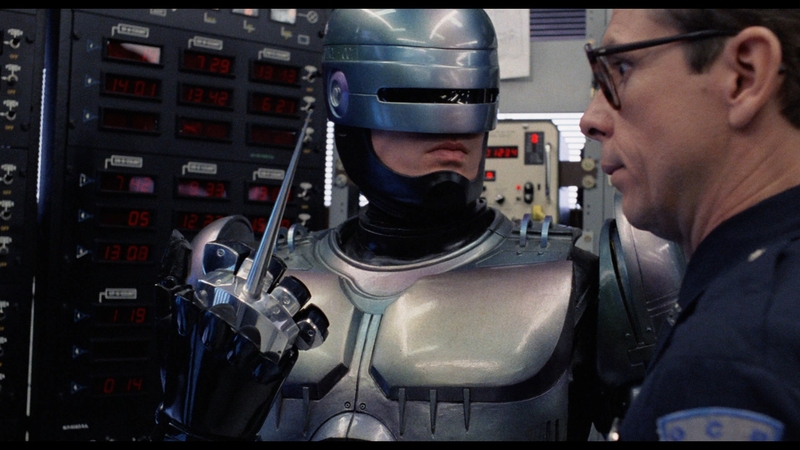 Distributed to Blu-ray for a third time, RoboCop is finally given the 4K mastering treatment under the guidance of MGM. Finally this feature takes on renewed HD life, with generous definition and purity in its color. 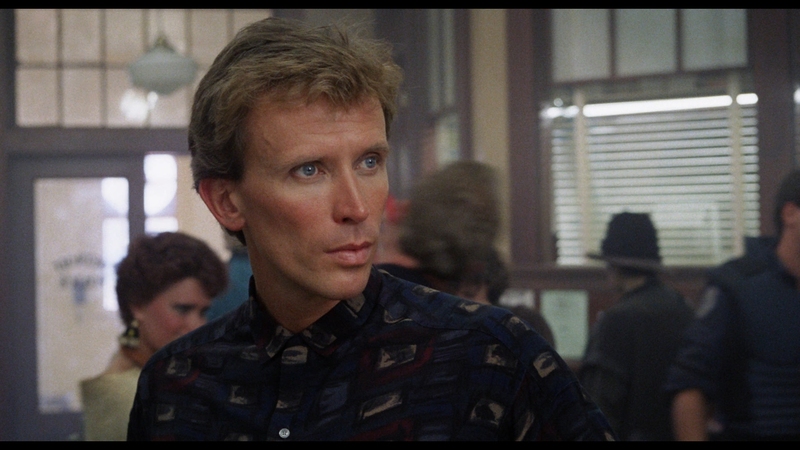 Any digitally graded touch-up has avoided obvious strokes of teal, rendering the ’80s icon natural. Flesh tones are lightly flushed to add weight without overstepping boundaries. Grain is (typically) resolved and maintained. A rough ’80s grit will create reasonable inconsistencies. Minimized moments of dirty encoding, particularly prior to ED-209’s ludicrously violent meeting room assault, are passable. Steady bitrates deliver on a stable, consistent structure which is pleasingly untouched by manipulation. Source material is unclouded, with print imperfections fixed or cleaned. 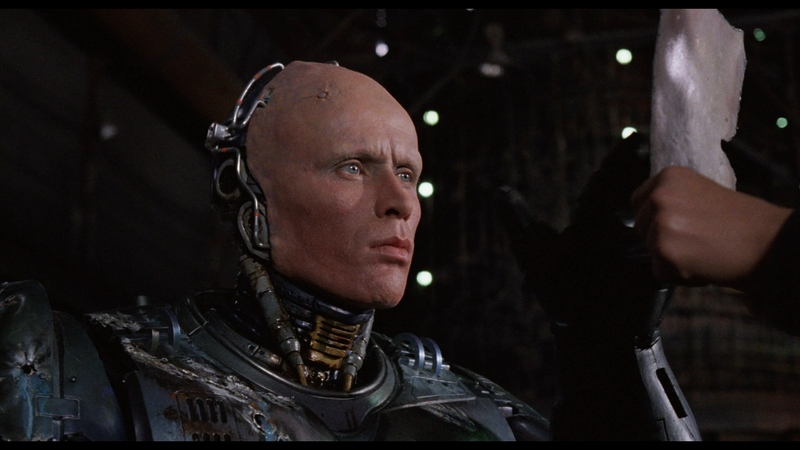 Restoration work has purified RoboCop. 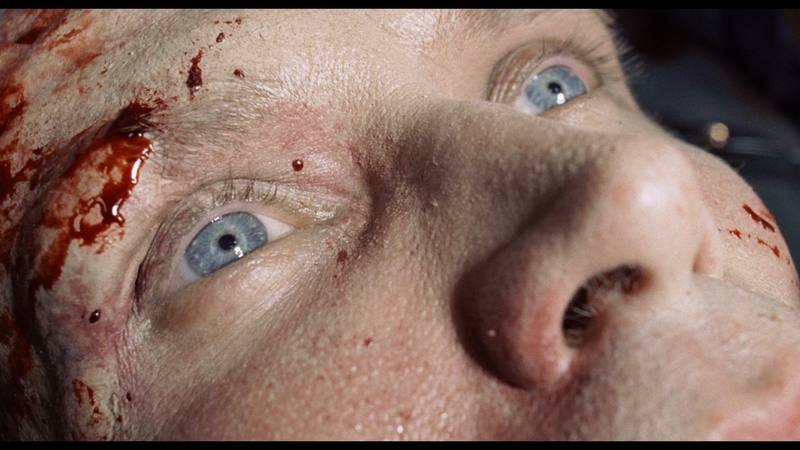 This was apparently the beginning as close-ups begin a march into perfection. Visible fine detail for this feature has never reached these levels on home video, and sharpness appears to have been exchanged with a modern film. Any doubts as to MGM/Fox’s claims regarding this release are not hyperbolic. This is more than a desperately needed switch from MPEG-2 to AVC. Final adjustments to contrast and black levels bring out depth, the only segment where modern tools were notably applied. Comparatively, black levels sink lower and contrast peaks higher than previous discs, removing the tinge of washed out appearances. 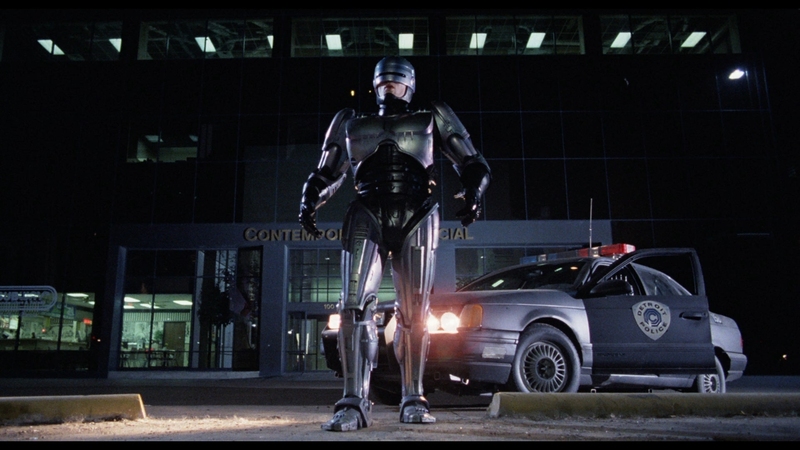 RoboCop is visually vivid and stout now, with more than enough reason to revisit. Audio sounds broadened alongside video, with a wider soundstage utilizing the rears with surprising frequency. 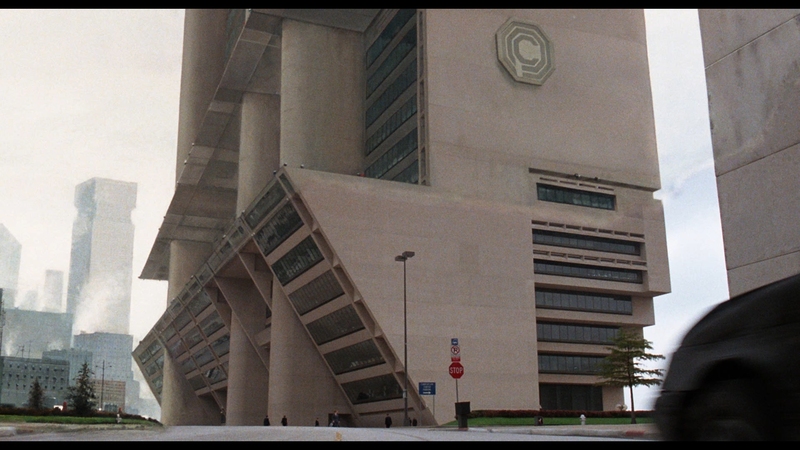 Isolated effects feel, well, isolated, such as ambient audio inside the police station piercingly placed in specific surrounds. The effect is appreciated, but it comes across unnatural and over focused. 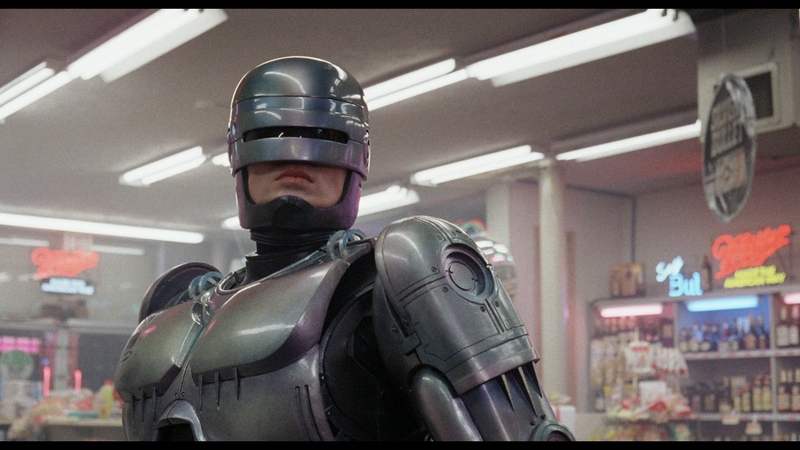 RoboCop is a feature of countless bullets which now ping each speaker as they pan across the soundfield aggressively. ED-209’s slaughter of a board room lackey is especially intense. By comparison, Murphy’s grandiose demise is ballooned with heavy LFE from punchy shotguns. However, each round lacks firmness and bass wanders to weaken punch. Explosions are sharper in the low-end and the ridiculous cannons given to the villains are enormous in their sound. Either way, these are clearly elements added on top of the original design. Pieces gel together poorly. Most will still enjoy this superficially intense action bonanza however. A discussion panel post-screening is the lonely new feature, bringing aboard various filmmakers including Verhoeven himself. The chat is lengthy at a touch over 42-minutes, offering retrospective on the production. What’s left has been available previously, remaining an extras package worth flipping through. 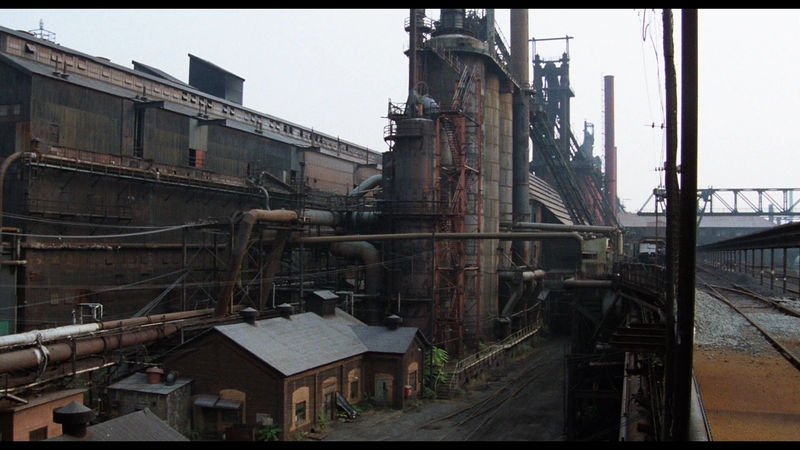 Flesh and Steel is the core making-of, an exceptional and interesting feature clocking in at 37 minutes. Two features from 1987 are purely in the realm of promo, if remaining enjoyable time capsules. 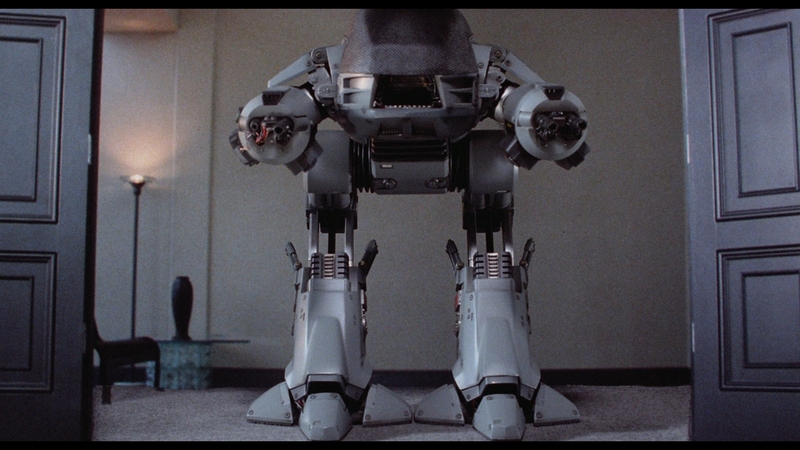 Phil Tippet jumps in to add commentary through a rundown of the ED-209 boardroom attack, focusing on stop motion. 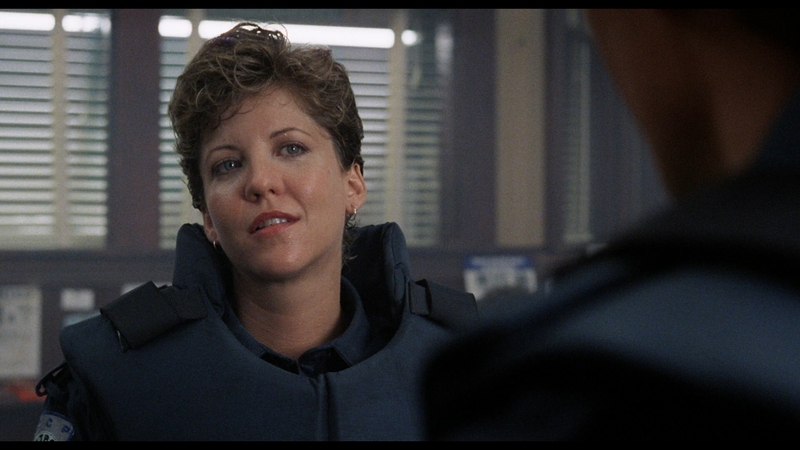 Four deleted scenes are quick to pass, followed up with Villains of Old Detroit, interviewing the gang of bad guys who haunt RoboCop. Special Effects Then and Now works through the ancient processes that brought the feature to life. Creating a Legend runs through the legacy, including the various mediums the character has been ported to. 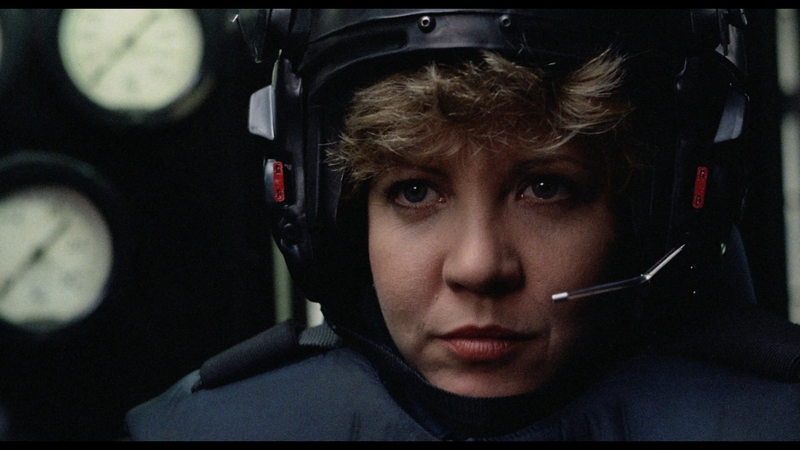 An easter egg cameo is mentioned, with Verhoeven, writer Ed Neumeier, and producer Jon Davison contributing to a commentary for the final bonus.